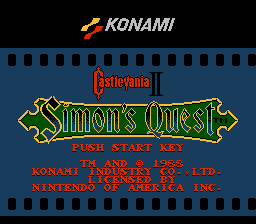 Castlevania II: Simon’s Quest is the most polarizing of the NES Castlevania titles. Though it took the series in new directions that would later be adopted by the series’ best entries, it is, to put it lightly, a rough blueprint of what was to follow. 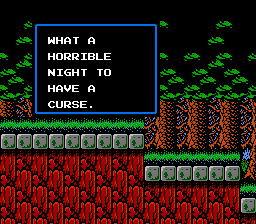 The inventive ideas that Castlevania II brings to the table are countered with often muddled execution, making this a Castlevania that requires a great deal of patience. Castlevania II: Simon’s Quest forgoes the more linear level progression of the original, and replaces it with something closer to an RPG. Simon still controls from a sidescrolling perspective, his trusty whip is still his primary means of attack, and there’s still platforming to be had. But now the secondary weapons are permanent, with the collectible hearts working as currency. Simon can gain experience and upgrade his whip. And towns now separate the action-oriented segments, which take place in the monster-infested wild and are capped off with mansions and castles. In concept, it’s a brilliant setup, made even more interesting by the game’s day and night cycles, with the night filling the towns with zombies and doubling the strength of monsters. But the game’s overly cryptic nature can make the game outright dumbfounding, and a poor translation only adds to the confusion. There are just too many elements that go unexplained throughout the game. For example, you may find that when traversing the haunted mansions Simon will randomly fall through certain platforms that bear no visual difference from any other platform. The only way to know which platforms are solid and which ones are traps is to continuously throw holy water at every platform. If the water falls through, you know it’s a trap. Not only is this process tedious, but there’s nothing in game that informs you of this. The people in the towns often give you “hints” of what you need to do, but rarely are they any real help. It’s said that in the Japanese version, the townsfolk are all liars, so you can’t trust what they have to say. I don’t know how helpful that in itself would be, but combine that with the game’s lackluster translation, and it just becomes all the more cryptic. Then there’s the mansions themselves, which don’t end with a boss fight, but by throwing an oak stake into an orb at the end of a mansion. You have to purchase the oak stakes within the mansions themselves, but you’re not told what you’re supposed to do with them. If you throw the stake at an enemy (which does nothing), you need to repurchase it, which is no small deal considering how long it takes to stock up on hearts. The whole game feels like it’s tailor-made to be played alongside a strategy guide. There are so many unexplained features that today’s gamers will be looking up online guides almost out of the gate. Another problem arises with the game’s difficulty. 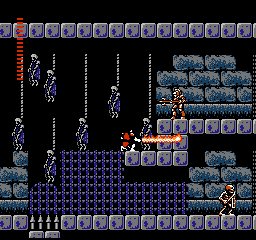 Some of the less desirable mechanics from the first game return, like the stair climbing, stiff jumping, and the intense knock back Simon receives from a single hit. While combating monsters can provide some old school fun, the game can become frustrating with how easy it is to die. It might not even be so bad, except that every time you die you lose all of the hearts you gathered, and every item costs a good number of hearts, so every time you die it’s going to take that much longer to progress even just a little bit. You may find yourself farming the same batch of enemies over and over (it in itself a monotonous task) just to stack up on hearts, only to lose them all because you got knocked into a pool of water. What’s worse is the only way to heal is by visiting one of the churches in the towns, which are only open in the day because at night the zombies come out. So you have a very limited window to heal up on top of everything else. There is some fun to be had with Castlevania II: Simon’s Quest, but chances are you’ll need a strategy guide in order to enjoy it. The game does, however, boast an incredible 8-bit soundtrack that stands as one of the best in the NES library. But even that doesn’t quite lift the game out of the rut it creates with its overly cryptic nature, repetitive adventure, and taxing challenge. As far as I can tell, there was a code in the Japanese version as to whether or not the townspeople were lying. If they began their sentences with “I heard that…” “It is said that…” or anything along those lines, you can safely bet that they are lying. Contrary to how most games work, if something is rumored, it’s almost never true. At best, it’s a heavily altered truth. If they didn’t begin their sentences in such a way, as long as you can actually verify the claim to begin with, it’s usually true. Unfortunately, this was distinction wasn’t always made in the English version. Other than that, yeah, Simon’s Quest isn’t really a bad game as much as it is a poorly executed one. If nothing else, one could say that this game is a precursor to the Metroidvania style that would result in Symphony of the Night. In that regard, it was reasonably ahead of its time, but there’s no getting around the fact that it just hasn’t aged well. That’s really interesting. Shame that aspect couldn’t have made it to the translated version. I definitely agree that the RPG element feels like a precursor to Symphony of the Night, though it’s definitely a rough precursor. It’s not a bad game, but one that definitely needed more explanation than it gives, and that aspect has only gotten worse with age.